Contact me if you missed the workshop but would like to join our community of researchers and practitioners using spatial risk modeling techniques for conservation. Click to download the workshop presentation. Miller, J.R.B. 2015. Mapping attack hotspots to mitigate human–carnivore conflict: approaches and applications of spatial predation risk modeling. Biodiversity and Conservation 24(12):2887-2911. Download for free on ResearchGate. 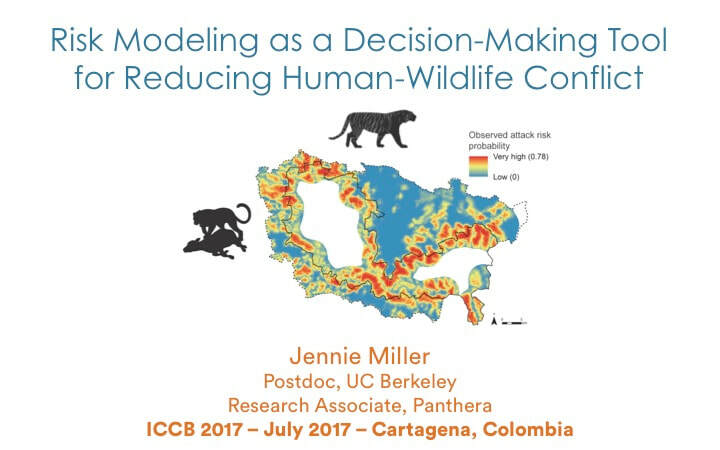 This list features peer-reviewed articles about spatial risk modeling and mapping related to human-wildlife conflict which were reviewed in Miller et al. 2015 (above), with some additions of more recent publications (through June 2017). Articles with hyperlinks are freely available for download or request; all others can be purchased on the journal website or through your university's subscription. I welcome additional submissions of related articles not yet listed here. Abade, L., Macdonald, D.W., Dickman, A.J., 2014. Assessing the relative importance of landscape and husbandry factors in determining large carnivore depredation risk in Tanzania’s Ruaha landscape. Biol. Conserv. 180, 241–248. Researchgate. Baruch-Mordo, S., Breck, S.W., Wilson, K.R., Theobald, D.M., 2008. Spatiotemporal distribution of black bear–human conflicts in Colorado, USA. J. Wildl. Manage. 72, 1853–1862. Carvalho, E.A.R., Zarco-González, M.M., Monroy-Vilchis, O., Morato, R.G., 2015. Modeling the risk of livestock depredation by jaguar along the Transamazon highway, Brazil. Basic Appl. Ecol. 16, 413–419. Researchgate. Constant, N.L., Bell, S., Hill, R.A., 2015. The impacts, characterisation and management of human–leopard conflict in a multi-use land system in South Africa. Biodivers. Conserv. 24, 2967–2989. Davie, H.S., Murdoch, J.D., Lhagvasuren, A., Reading, R.P., 2014. Measuring and mapping the influence of landscape factors on livestock predation by wolves in Mongolia. J. Arid Environ. 103, 85–91. Researchgate. Edge, J.L., Beyer, D.E., Belant, J.L., Jordan, M.J., Roell, B.J., 2011. Adapting a predictive spatial model for wolf Canis spp. predation on livestock in the Upper Peninsula, Michigan, USA. Wildlife Biol. 17, 1–10. Jacobs, C.E., Main, M.B., Roca, A.L., 2015. A conservation-based approach to compensation for livestock depredation: The Florida panther case study. PLoS One 10, 1–19. Johnson, H.E., Breck, S.W., Baruch-Mordo, S., Lewis, D.L., Lackey, C.W., Wilson, K.R., Broderick, J., Mao, J.S., Beckmann, J.P., 2015. Shifting perceptions of risk and reward: Dynamic selection for human development by black bears in the western United States. Biol. Conserv. 187, 164–172. Access here. Kaartinen, S., Luoto, M., Kojola, I., 2009. Carnivore-livestock conflicts: determinants of wolf (Canis lupus) depredation on sheep farms in Finland. Biodivers. Conserv. 18, 3503–3517. ResearchGate. Karanth, K.K., Gopalaswamy, A.M., Prasad, P.K., Dasgupta, S., 2013. Patterns of human–wildlife conflicts and compensation: insights from Western Ghats protected areas. Biol. Conserv. 166, 175–185. ResearchGate. Karanth, K.K., Gopalaswamy, A.M., DeFries, R.S., Ballal, N., 2012. Assessing patterns of human-wildlife conflicts and compensation around a central Indian protected area. PLoS One 7, e50433. Luigi, B., 2017. Assessing wild canid depredation risk using a new three steps method : the case of Grosseto province ( Tuscany , Italy ). Hystrix 1–7. Access here. Marucco, F., McIntire, E.J.B., 2010. Predicting spatio-temporal recolonization of large carnivore populations and livestock depredation risk: wolves in the Italian Alps. J. Appl. Ecol. 47, 789–798. ResearchGate. Meena, V., Macdonald, D.W., Montgomery, R. a., 2014. Managing success: Asiatic lion conservation, interface problems and peoples’ perceptions in the Gir Protected Area. Biol. Conserv. 174, 120–126. esearchGate. Milanesi, P., Caniglia, R., Fabbri, E., Galaverni, M., Meriggi, A., Randi, E., 2015. Non-invasive genetic sampling to predict wolf distribution and habitat suitability in the Northern Italian Apennines: implications for livestock depredation risk. Eur. J. Wildl. Res. 61, 681–689. ResearchGate. Miller, J.R.B., Jhala, Y. V., Jena, J., Schmitz, O.J., 2015. Landscape-scale accessibility of livestock to tigers: implications of spatial grain for modeling predation risk to mitigate human-carnivore conflict. Ecol. Evol. 5, 1354–1367. ResearchGate. Miller, J.R.B., Jhala, Y. V., Jena, J., Schmitz, O.J., 2016. Human perceptions mirror realities of carnivore attack risk for livestock: implications for mitigating human-carnivore conflict. PLoS One 11, e0162685. Miller, J.R.B., Jhala, Y. V., Jena, J., 2016. Livestock losses and hotspots of attack from tigers and leopards in Kanha Tiger Reserve, Central India. Reg. Environ. Chang. 16, 17–29. ResearchGate. Olson, E.R., Treves, A., Wydeven, A.P., Venutra, S., 2014. Landscape predictors of wolf attacks on bear-hunting dogs in Wisconsin, USA. Wildl. Res. 41, 584–597. ResearchGate. Rostro-García, S., Tharchen, L., Abade, L., Astaras, C., Cushman, S.A., Macdonald, D.W., 2016. Scale dependence of felid predation risk: identifying predictors of livestock kills by tiger and leopard in Bhutan. Landsc. Ecol. 31, 1277–1298. ResearchGate. Shrader, A.M., Brown, J.S., Kerley, G.I.H., Kotler, B.P., 2008. Do free-ranging domestic goats show “landscapes of fear”? Patch use in response to habitat features and predator cues. J. Arid Environ. 72, 1811–1819. ResearchGate. Soh, Y.H., Carrasco, L.R., Miquelle, D.G., Jiang, J., Yang, J., Stokes, E.J., Tang, J., Kang, A., Liu, P., Rao, M., 2014. Spatial correlates of livestock depredation by Amur tigers in Hunchun, China: relevance of prey density and implications for protected area management. Biol. Conserv. 169, 117–127. ResearchGate. Treves, A., Martin, K. a., Wydeven, A.P., Wiedenhoeft, J.E., 2011. Forecasting environmental hazards and the application of risk maps to predator attacks on livestock. Bioscience 61, 451–458. ResearchGate. Treves, A., Naughton-treves, L., Harper, E.K., Mladenoff, D.J., Rose, R.A., Sickley, T.A., Wydeven, A.P., 2004. Predicting human-carnivore conflict: a spatial model derived from 25 years of data on wolf predation on livestock. Conserv. Biol. 18, 114–125. ResearchGate. Wilson, S.M., Madel, M., Mattson, D., Graham, J.M., Merrill, T.W., 2006. Landscape conditions predisposing grizzly bears to conflicts on private agricultural lands in the western USA. Biol. Conserv. 130, 47–59. ResearchGate. Winterbach, H.E.K., Winterbach, C.W., Boast, L.K., Klein, R., Somers, M.J., 2015. Relative availability of natural prey versus livestock predicts landscape suitability for cheetahs Acinonyx jubatus in Botswana. PeerJ 3, e1033. ResearchGate. Zarco-González, M.M., Monroy-Vilchis, O., Alaníz, J., 2013. Spatial model of livestock predation by jaguar and puma in Mexico: conservation planning. Biol. Conserv. 159, 80–87. ResearchGate.